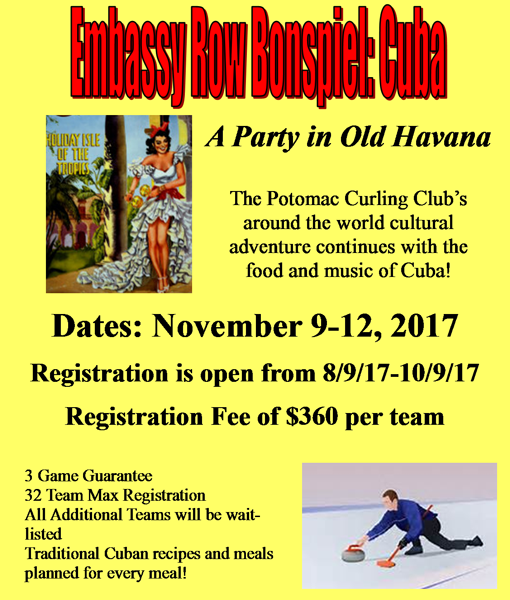 The Potomac Curling Club's around the world cultural adventure continues with the food and music of Cuba! Traditional Cuban recipes and meals planned for every meal! Fun team names are welcome, but we ask that names avoid references to the Cuban Refugee Crisis or the Castro family. Registration fees will be collected via PayPal / Credit Card at the time of registration. A maximum of 8 potomac teams are allowed to register (all slots are first-come first-serve). A potomac team is a team with 3 or more members from the Potomac Curling Club. Calling? Use group name "Embassy Row 2017"